At the end of 2017 we have finished the work on the Extension project that ended with public release of Version 5 of the ISC-GEM catalogue in February 2018. As a result of the Extension project, we have considerably improved the magnitude cut-off thresholds during the early instrumental period and updated the catalogue with recent earthquakes during 2010-2014 (Fig. 1). Figure 1. Annual number of earthquakes above certain magnitude level in the main ISC-GEM catalogue at the end of the Extension project (Ver.5). Whilst working on the last stages of the Extension project, we were planning further investigations and consequent catalogue improvements under the new Advancement project. This future work will help to maintain the comprehensive and homogeneous character of the ISC-GEM catalogue, add new data to both existing and new earthquakes and keep the catalogue up-to-date. Over the last seven years we digitised and included the arrival time and body/surface wave amplitude and period information from a very large volume of individual station and network bulletins in order to re-compute the location and magnitude of each earthquake ( Di Giacomo et al., 2015a ). For each earthquake, at least three different station reports were required to compute a reliable estimate of MS magnitude to be then converted to MW where the latter is not independently available. The absence of three consistent measurements has stopped many earthquakes from being included into the Main ISC-GEM catalogue (Fig. 2). Such earthquakes remained part of the Supplementary catalogue of earthquakes with highly uncertain determinations of magnitude and/or location. Figure 2. 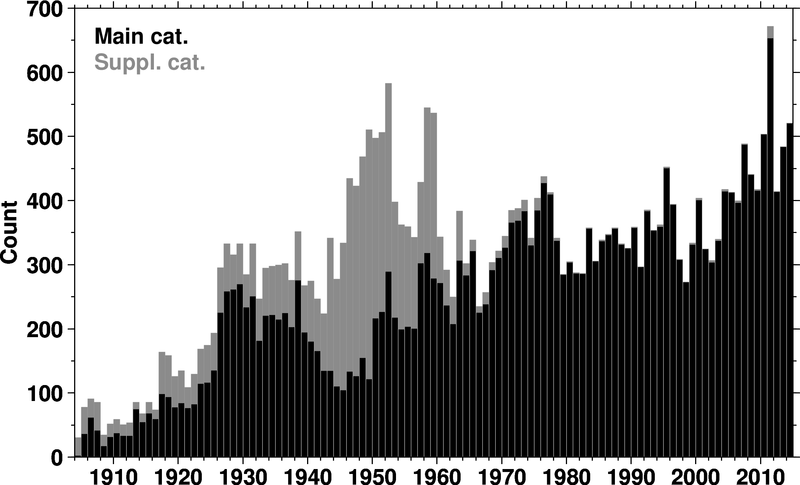 The annual number of earthquakes in the Main (black) and Supplementary (grey) ISC-GEM catalogues; we have excluded a number of earthquakes in the supplementary catalogue with magnitudes likely to be below the standard magnitude threshold. We believe that now is the right moment to review the report timelines of several tens of individual high-quality stations that have contributed surface wave amplitude and periods for the early instrumental period before 1970. As an example, Figure 3 shows the timelines of amplitude and period reports from stations of the former USSR. Some of the distinct gaps observed in reporting of many stations can be explained by the devastation of the Second World War and consequent recovery and re-establishment of many stations as part of the new united network of seismological observations. Nevertheless, it is worth investigating the apparent gaps and real availability of parametric measurement data for those stations that were not in the temporarily occupied territories, such as BAK, IRK, MOS, SVE, TIF and VLA and for which the relevant data had been reported before the war. We would try contacting the individual stations to see if original operator’s reports or station bulletins missing from the ISC collection are available there. We already have had reasonable success making such enquiries in the past when suitable opportunities had risen during our regular ISC communication or travel. Figure 3. 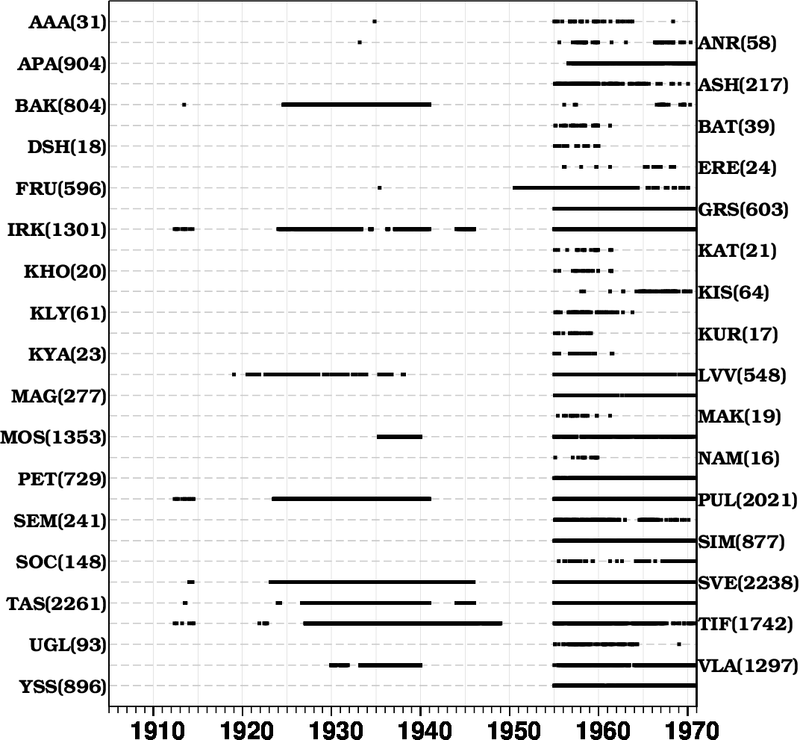 Timeline of the surface wave amplitude and period reports from individual seismic stations of the Former USSR. We have to stress that certain advances are also expected in other areas/continents; the stations of former USSR have been chosen here only as an example. We believe that this work will help to promote many historical earthquakes from the Supplementary to the Main catalogue. Secondly, this work will bring additional data that will help to improve the accuracy of magnitude determinations (and possibly the location) of those earthquakes already in the Main ISC-GEM catalogue. Determination of the uniform MW magnitude throughout the ISC-GEM catalogue is based on either GCMT or the MS/MW and mb/MW magnitude regression curves developed during the project (Di Giacomo et al., 2015b). However, the initial selection of earthquakes from the ISC Bulletin though was not based on these regressions, as they were not available at the time. We shall review the initial earthquake selection during 1960-1990 and add a number of previously excluded moderate earthquakes in order to improve the magnitude completeness of the ISC-GEM catalogue during this period. It would help regional studies of seismic hazard if we supplemented the ISC-GEM catalogue with smaller yet still damaging earthquakes, such as the mb 5.2 Dulce, New Mexico 1966 earthquake (Fig.4) or the MW 5.1 Lorca 2011 earthquake in Spain. This work would also assist calibration of local catalogues and magnitudes in individual regions where the ISC-GEM catalogue can be used as a reference. Figure 4. Modified Mercalli intensity map for the Dulce, New Mexico earthquake of Jan 23, 1966; The earthquake caused damage to homes, schools and other public buildings with the maximum modified Mercalli intensity VII+; courtesy of Hoffman and Northrop (1977) and Seismological Research Letters. We are planning to complement the ISC-GEM catalogue with earthquakes that occurred in continental areas since 1960, with MW between 5.0 and 5.5, based on the ISC Bulletin. 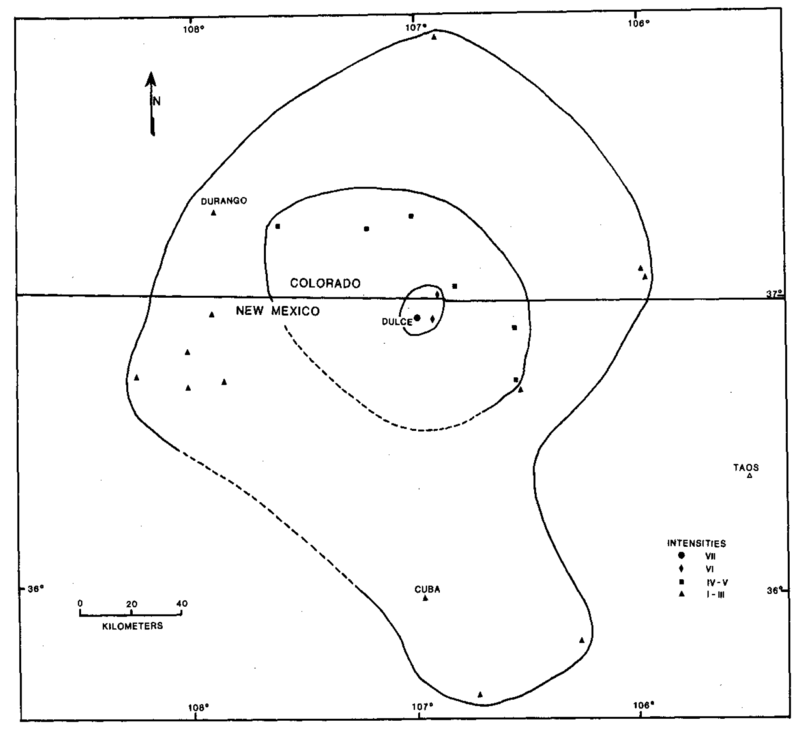 It is a common knowledge that recording of earthquakes at the beginning of the 20th century was often made by station networks with quite poor geometrical configuration with respect to the earthquake sources. This resulted in low station azimuthal coverage and large uncertainties in the earthquake location. We would like to try working together with the macroseismic community to review parameters of large felt and damaging earthquakes during the 1900-1920 period where addition of macroseismic information may lead to better-constrained hypocentre solutions. At the time of major data entry work for the ISC-GEM catalogue, we have chosen to mainly use the printed volumes of the International Seismological Summaries (ISS) and the ISC’s collection of individual station and network bulletins because those contained well-formatted comprehensive information in a tabulated form and have already been partly scanned and sometimes even digitised. Now we would like to complement these data with the data from Bureau Central International Seismologique (BCIS). For considerable periods of time, ISS in England and BCIS in France have been running global bulletin operations in parallel with an element of apparent duplication in their missions. The original sources of data coming to ISS and BCIS varied. We shall concentrate on recovering additional station arrival times for earthquakes already in ISC-GEM in order to improve the station azimuthal coverage and hence the accuracy of locations. We shall also look out for earthquakes that may have been missed by the ISS in those time periods when funding shortages dictated unfortunate rise in earthquake magnitude cut-off thresholds. We plan to monitor recent publications (Fig. 5) in several tens of journals for new and updated determinations of historical earthquake sources, magnitudes and moment tensor parameters based on analogue or digital seismogram records and update the ISC-GEM catalogue accordingly. We shall make a concerted effort to link earthquakes in the ISC-GEM catalogue to known bibliographical references to scientific articles describing these earthquakes. Figure 5. 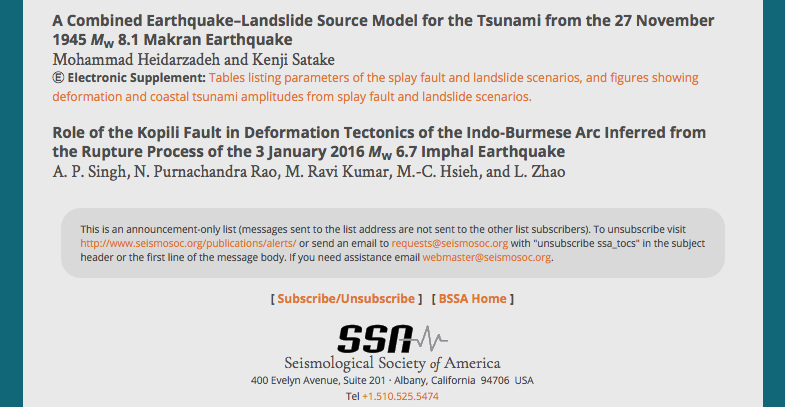 An example of the recent Early Publication Content Alert from the Bulletin of Seismological Society of America with two new articles published on the 1945 MW 8.1 Makran earthquake and tsunami as well as the 2016 MW 6.7 Imphal earthquake on Indo-Burmese Arc. We have already searched through scientific literature for accurate direct determination of scalar moment and moment magnitude of certain earthquakes studied by individual scientists or groups of scientists. We have never attempted to include determinations of fault plane / moment tensor solutions into the catalogue. These are usually derived by individual scientists from various techniques and data sources such as digitized waveform inversions, visible surface rupture, direction of body wave first motions, configuration of the aftershock zones etc (Fig. 6). It would be of considerable value for consequent seismic hazard studies, if the fault planes were also included into the ISC-GEM catalogue, especially for the years before 1976 when the Global CMT project has begun. Figure 6. Diane Doser used body waveform inversion techniques to study the source parameters of four earthquakes along the southern San Jacinto and Imperial faults: 1937 Buck Ridge, 1940 Imperial Valley, 1942 Borregon Mountain and 1954 Salada Wash events. These fault plane solutions can be included in the ISC-GEM catalogue. The figure is courtesy of BSSA and D. Doser (1990). 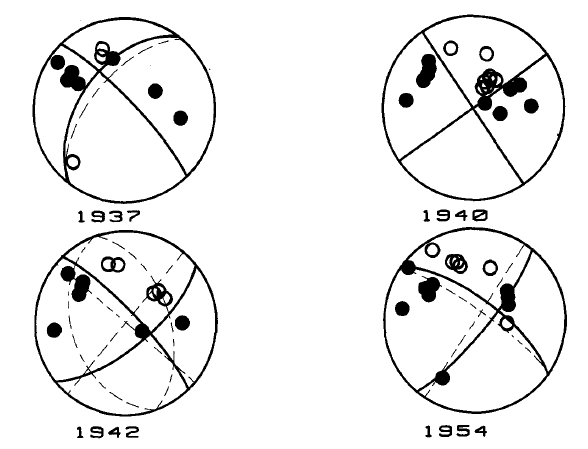 We are currently updating the ISC Bulletin (1964 onwards) with the recomputed ISC hypocentres based on the new location program, ak135 velocity model and robust magnitude calculation scheme ( Bondár & Storchak, 2011 ). As part of this project, we bring numerous data of both permanent and temporary (experimental and aftershock) deployments that were missing from the ISC Bulletin. We shall update the ISC-GEM catalogue in the modern instrumental period based on the previously unavailable datasets that may help to improve the accuracy of ISC-GEM parameter determinations. At the same time, together with University of Colorado Boulder, we are working on another project to review and improve the ISC-EHB dataset of well-recorded seismic events ordinarily used for tomographic studies. This dataset benefits from more precise event depth determination. Some earthquakes are common to both the ISC-GEM and the ISC-EHB. We shall review the relevant outcomes from the ISC-EHB project to see which ISC-GEM earthquakes may require an update. We shall continue the update of the ISC-GEM catalogue with earthquakes of recent years beyond 2014 as and when each new data year of the reviewed ISC Bulletin becomes available. We shall implement the same earthquake selection, location and magnitude determination procedure to keep the ISC-GEM catalogue as homogeneous as possible. We shall incrementally improve the ISC-GEM catalogue. An upgraded version of the catalogue will be made publicly available at the beginning of March of each following year, giving lead time to Project Sponsors. Bondar, I. and D. Storchak, 2011. Improved location procedures at the International Seismological Centre, Geophys. J. Int., 186, 1220-1244, doi: 10.1111/j.1365-246X.2011.05107.x. Di Giacomo, D., J. Harris, A. Villaseñor , D.A. Storchak, E.R. Engdahl, W.H.K. Lee and the Data Entry Team, 2015. ISC-GEM: Global Instrumental Earthquake Catalogue (1900-2009), I. Data collection from early instrumental seismological bulletins, Phys. Earth Planet. Int. , 239, 14-24, doi: 10.1016/j.pepi.2014.06.003. Di Giacomo, D., I. Bondár, D.A. Storchak, E.R. Engdahl, P. Bormann and J. Harris, 2015. ISC-GEM: Global Instrumental Earthquake Catalogue (1900-2009): III. Re-computed MS and mb, proxy MW, final magnitude composition and completeness assessment, Phys. Earth Planet. Int. , 239, 33-47, doi: 10.1016/j.pepi.2014.06.005. Doser, D., 1990. Source characteristics of earthquakes along the Southern San Jacinto and Imperial fault zones (1937 to 1954), Bull. Seism. Soc. Am., 80, 1099-1117. Hoffman, J.P. and Northrop, S.A., 1977. The Dulce, New Mexico earthquake, January 23, 1966, Seismol. Res. Lett., 49, 3-20. Storchak, D.A., D. Di Giacomo, E.R. Engdahl, J. Harris, I. Bondár, W.H.K. Lee, P. Bormann and A. Villaseñor, 2015. The ISC-GEM Global Instrumental Earthquake Catalogue (1900-2009): Introduction, Phys. Earth Planet. Int. , 239, 48-63, doi: 10.1016/j.pepi.2014.06.009.